"We had dramatic results in the first year of the Better Together program at Leeds Elementary School. The school documented that there was an 80% reduction in unwanted behaviors in the second grade and a 35% reduction in the fifth grade, the two grade levels which received focus." These practices – how to talk it out and how to have conversations that change exclusion, mistreatment and bias – are presented for teachers and parents. Learn also how songs set new norms and create a positive culture. The text also includes lyrics and activities for all forty time-tested songs. 200 page book and double CD set of 40 songs. Set of book and double CD: $35 plus $5 postage. The 2 CD package is an eco-wallet with no plastic. Published by Levellers Press, Florence, MA. Click here for the names of the over 4 dozen people who were part of the BETTER TOGETHER book and CD as teachers, musicians, recording engineers, singers, and songwriters. 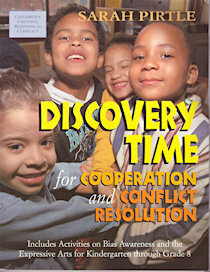 Published by the Creative Response to Conflict Program in Nyack, NY. Educators for Social Responsibility asked me to share what I've done in early childhood classrooms for 25 years. 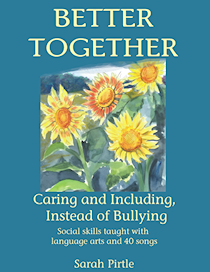 The result is chockfull of easy-to-use suggestions to help build social and emotional competence. "Early childhood teachers preserve endangered human values and abilities: cooperation, mutual regard and respect for diversity. It is to this important work that this book and these songs are dedicated." 300 page book plus CD recording with 46 songs for $35 Includes 20 songs that are bilingual in Spanish. The recording is enhanced by the beautiful harmonies and piano playing of Roberto D?az and a community chorus of children. "Sharing these lively wonderful songs and clear methods of communication with children will have a profound affect on classrooms and families. This is a complete teacher training course on conflict resolution and bias prevention." — Mara Sapon-Shevin, Professor of Education, Syracuse University. See the Talk It Out section of this website to find a key song from this book: "Two in the Fight." Lyrics are sung to a traditional tune, "There were Two in the Bed" and it models how to talk out a conflict. Speak up when something's not fair. Speak up and show that you care. Speak up when something's not right. Speak up and follow your light. Speak up, we need your voice in this world. How can we help when we see someone else mistreated? Read this poem and then role play responses. Use the song lyrics to introduce the idea of communicating your concerns. Poem: "How Can I Speak Up?" two kids tease her everyday. Others do nothing and look away. Sarah Pirtle has discovered that one of the most effective methods of teaching positive social skills in the early childhood years is through music and movement because children have an opportunity to practice skills while feeling supported and guided. Linking Up! 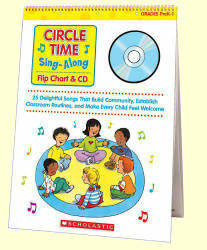 offers time-tested songs which are effective teaching tools in early childhood classrooms. Find activities that model how to set clear personal boundaries and give practice at responding to the messages of friends. Learn four dozen song games that build connection among members of a caring community. Hear songs that provide a chance to explore differences and advocate for fairness, inclusiveness, and mutual respect. Find songs that encourage constructive methods for solving problems. Learn how to make a classroom wall chart with photographs of children from the class as they demonstrate the stages of talking out a conflict. The 46 songs include: "Buenos Días al Cielo"
"The Colors of Earth" which can be found in the Lyrics section of this website. "My Space / Mi Espacio." Children move within their own space bubble, singing, "there's no better place in the world for me." "Shake, shake, freeze." Children alternate moving and pausing while they sit, then stand, then walk together with awareness of others. "When I Say Stop, I Mean Stop." Children learn what words will help send a constructive message. "How Can We Be Friends Again?" asks children to think about what makes a problem worse or better and add their own words. Song 11: "Peanut Butter and Applesauce"
How can you move through peanut butter? Lift one foot and then the other. The set includes a sturdy cardboard flip-chart of 25 pages with laminated song lyrics and the CD produced by A Gentle Wind in Albany, NY. Twenty-five simple songs build community, establish classroom routines, and help child feel welcome. 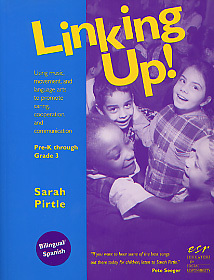 Twelve of the songs were written by Sarah and she co-authored the short teacher guide. Published by Scholastic. Seven chapters written by Sarah Pirtle. A companion to Tomorrow's Children by Riane Eisler, Partnership Way. Excerpt from "Partnership Education in Action"
Goals: to develop a personal reference for the meaning of partnership to gain new insights by hearing other's memories of partnership. Overview: This is an excellent activity for staff training as well as with students. Optional equipment: A basket, a piece of pottery, and stones that can be held in the palm. 1. Sit in a circle. If you are using stones, provide one for each person to hold. Participants report that this tactile experience helps evoke their memories. Point to the basket and the pottery and explain that objects like these have been made throughout the world for thousands of years. Pause to discuss this together. 2. Ask, "Think of a memory of a time that you experienced partnership." During sharing, use a popcorn approach instead of going around the circle so that whoever has a memory can speak first. Often, hearing others' experiences, sparks recall. Make sure everyone has a chance to talk, but also allow people to pass. Encourage an expansive definition of partnership. In fact, if a student says, "I'm not sure that this is really an example of partnership," encourage them to share it and clarify that what you are interested in is their personal definition; all examples are welcome. Option: Pass a talking object around, such as the basket, for people to hold while they are speaking. Example: "My family moved a lot. I remember being new in a school in second grade. Everyone was waiting in line outside the school building the first day. Some girls came over to me and said, 'Come on, join us,' and introduced me to other kids. This made a big difference in how I felt." 3. Reflect upon what the stories reveal about the meaning of partnership. You may notice qualities such as feeling trusted, having creativity encouraged, experiencing freedom, feeling welcomed into the adult world as well as elements of cooperation and collaboration in the stories. Rather than trying to apply a narrow standard of what partnership means, we are trying to study it in all its forms. 4. If you have a basket and a piece of pottery, reflect as well upon ways people have passed on skills from generation to generation. Ask: how long ago do you think the first baskets were made? Think about the partnership that exists between one generation and the next. An Outbreak of Peace (New Society Publishers, 1987) received the Olive Branch Award for the outstanding book of the year on world peace. The story focuses on the coming-of-age of a thirteen-year-old girl as she asks her small New England town to declare an outbreak of peace. A key theme of the book is expanding understanding of peace and unlearning racism. The main characters are Polish-American, African-American, Puerto Rican, and Japanese American. Readers learn about the Internment Camps during WWII, the bombing of Hiroshima, and most of all about the complexities of human interactions. Although it is written as a young adult novel, it has had a strong impact on adults as well. Studs Terkel said in an hour-long interview: "This book is a natural for both young people and adults." Two dozen young people illustrated the book and were involved in shaping it. Young illustrators were given contracts and were paid for their work. At our press conference, the young people fielded questions and took turns accepting a question from a student and then a question from an adult so that voices from all ages could be heard. When the award was given in New York City, illustrator Amanda Cohen came up to the podium with Sarah and they accepted it together on behalf of the whole group. "Sarah Pirtle's novel for young readers is an inspiring book that communicates the message that there is something young people can do to make a statement about peace on a personal level. It is a realistic book with believable adult characters whose concerns, whether they favor or oppose 'an outbreak of peace' are taken seriously. But it is Sarah Pirtle's sensitivity to young people and their feelings that simply shines through." "Than you for being brave enough and centered enough to write An Outbreak of Peace. My opinion? Incredible! I can't believe you did it – I can't believe it could be done. And, you remembered what it was like to be fourteen." An Outbreak of Peace is currently out of print. You may be able to locate copies through searches on the web. Please contact me if you can suggest a publishing house that might be interested in reprinting. Also let me know if you'd like to be informed when the book goes back into print.